Significant public investment in tarmac continues to satisfy the highways lobby with its lazy preference for the privacy, isolation and immediacy offered by the car. Its cathedrals are the multi-storeys, to which supplicant drivers are daily drawn from their suburban residences. These acts of ritual experience turn multi-storeys into machines for urban decline, accelerating the processes of planning blight, suburban sprawl and climate change. Any town building highway infrastructure on this scale has given up on the environment. In the town which aspires to be little more than a vehicle gyratory, the multi-storey becomes destination, a civic landmark with monumental status. 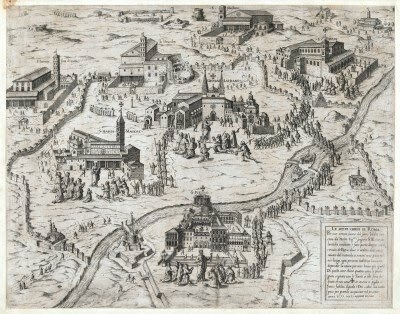 In 1575 Antonio Lafreri published a map depicting the 7 pilgrimage churches of Rome, "Le Sette Chiese di Roma", with a drawing attributed to Giovanni Ambrogio Brambilla. The map was published under the umbrella title "Speculum Romanae Magnificentiae" (The Mirror of Roman Magnificence). This drawing re-imagines Le Sette Chiese as Le Sette Parcheggi: the 7 great multi-storeys of Stockport. Exhibited Stockport Art Gallery 2017.